I wanted to write about the Haitian earthquake, and then the Chilean quake came, five hundred times as powerful. The Richter Scale is base-ten-logarithmic, so a difference between a 7.0 and an 8.8 quake is ten to the one-point-eight, taken to the one-point-five. (I’d forgotten how logs work, and I only had the vaguest of ideas of how the Richter Scale works, so I had to look this up.) While the mechanics of the planet’s continental drift are interesting, what insensitive jerk keeps score, when human beings are getting kicked in the shorts. Instead, I’m going to review a series of comic books. I discovered Batman: No Man’s Land at the neighborhood branch of the Hennepin County Library. Can you believe they have comics at the library? This is probably one of the more sophisticated ones. It comes in five volumes, and I read One and Four. When Frank Miller wrote Batman: The Dark Knight twenty or so years ago, readers and the funny-book industry took notice. The Dark Knight is a gritty, noir thriller, and Miller has a feeling for character and plot, as well as a satirical outlook on our moment in history. DK was comic’s High Noon, an adult read in a puerile millieu, and it gave comic book writers and artists permission to examine the darkness in the souls of their characters, and our world, if few did it with Miller's art. Batman is, of course, the masked and muscular vigilante who guards Gotham City -- a stand-in for the island of Manhattan -- from quirky supervillains like Two Face, the Penguin, the Joker, etc. He is aided by Robin the Boy Wonder, Commissioner James Gordon, Batgirl, etc., etc., and etc. 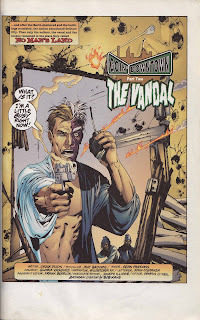 No Man’s Land’s premise is that Gotham City has suffered a massive earthquake. The rest of the United States, presumably with problems of their own, have abandoned Gotham to its own devices, dynamited its bridges, and posted patrols to keep Gothamites on the island, and the infrequent smuggler or maniac out. Various gangs, including the police and a splinter faction of cops, neighborhood thugs, and the supervillains’ organizations, control territories within the city. NML was published in 1999, and probably would have been different -- at least by not representing ruined skyscrapers as leaning, largely intact, above rubble -- if produced after September, 2001. The twenty or thirty writers and artists have imagined post-disaster poverty pretty well. Food, water, tools, and ammunition are all bought and sold at a premium. There is a barter network, ruthlessly controlled by the parasitic Penguin. People risk their lives and dignity for beans and bullets. A pacifist physician, friend of Batman’s murdered parents, operates a hospital under tents, giving what comfort she can to the teeming injured, and caring for their wounds with what few supplies Batman can find. Writing is about on the prime-time soap level of Dallas or The X-Files. You have stock characters interacting, and revealing themselves, over time, within a difficult setting. Exposition is uneven. I found myself going “Who the hell is that,” or “What just happened,” on one page, and "Just shut up and tell the story," on the next. NML"s characters are, let’s just say, preposterous, and one way the comic medium advances a story is through speech balloons, so cut the denizens of Gotham some slack when they get a little windy. The most articulate of the characters, though, is the mute Batgirl, whose mask completely obscures her features. 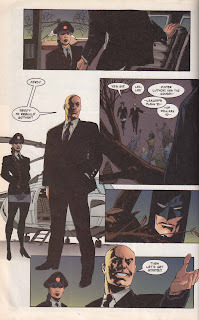 Although the US abandons Gotham City for purposes humanitarian, Gotham is not forgotten by Superman’s nemesis, Lex Luthor, who appears on the final page of Volume Four, ready to rebuild and claim it for his own.